Here is your standard personal page. 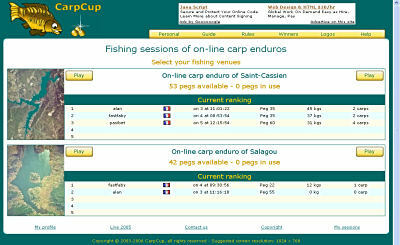 On the left side, all actual on-line carp enduros rankings are displayed real-time. On the right side, there are action push buttons and more particularly the one to take part in on-line carp enduros and carry out fishing sessions. To proceed, all you have to do is click on the "New Session" button. To take part in an on-line enduro, you first have to choose an associated fishing venue. All the venues corresponding to open enduros for the current week are displayed on this page. For each of them, the Top100 ranking is displayed, showing all the relevant details. In order to guide you in your choice, the number of pegs available and the number of pegs in use are displayed. To go to the chosen venue, click on the photo or on one of the two associated "Play" buttons. Next, CarpCup will send you the elements associated with the chosen venue via the Internet. Downloading time will depend on the speed of your Internet connection. Hence this page displays download progress as a percentage and the size in kilo-bytes. The internet connection bandwith do not have an influence on your capability to achieve good fishing sessions. And low-rate and high-rate connections have similar chances to perform weel in on-line carp enduros.